I had wanted to make some little boxes for this challenge but as is too often these days, I ran out of time. I was lucky enough to find some acetate jackets in my stash already folded and printed with white wavy frames. I vaguely remember buying them eons ago ! They are perfect for this project and so I added some glittery gold peel off frames directly onto the acetate and mounted some christmas peel offs onto paper, coloured and cut them out for mounting onto the acetate with tiny sticky foam pads. 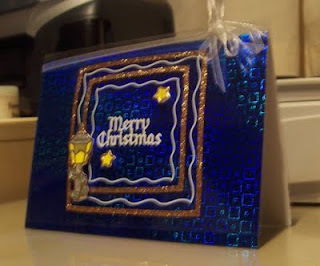 I love the intense blue of the foiled card I used (for 3yr olds and upwards). Why should kids have all the fun, LOL, and I stuck a white Christmas greeting in the centre then finished it off with thin white organza ribbon. Love the intense blue of the holographic card ... looks great with the white and gold. Yep, I'm with you on the time thing too, I'm sure my days only consist of about 12 hours now!! Love the foiled card, it looks great (I have on occasion raided the children's craft aisle!) & finished off perfectly with the ribbon.